Barely a couple of days after the government announced its decision to hike import tax on mobile phones, video cameras, and televisions, Apple has updated prices across the entire iPhone range, except the iPhone SE. On Friday, the government said that mobile imports will now be taxed at 15 percent instead of 10 percent, an increase of 5 percentage points, as part of a decision designed to help curb supplies from overseas and build up the domestic industry. 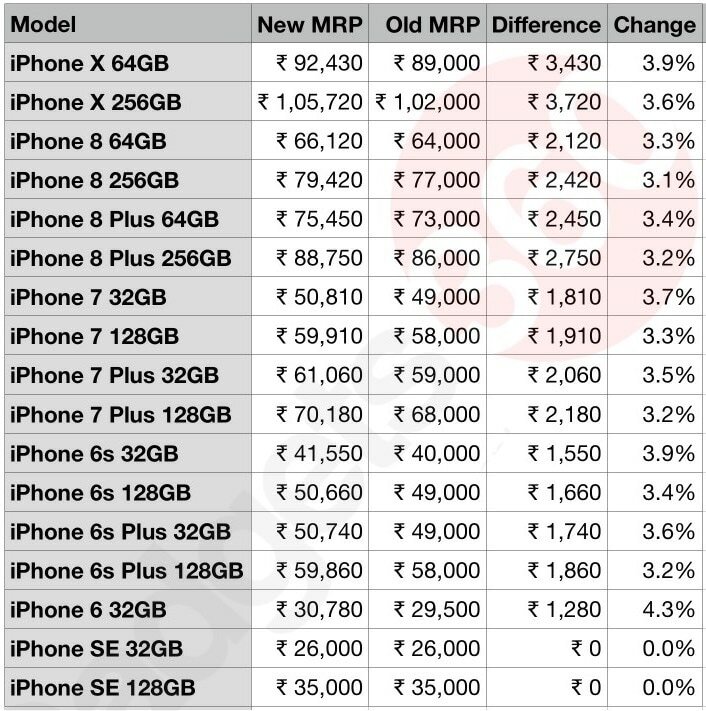 On Monday, Apple increased iPhone India prices by around 3.5 percentage on average, with the iPhone 6 seeing the highest price increase in percentage terms (4.3 percent), while the 256GB iPhone 8 price has increased by 3.1 percent only. The iPhone 6 is now priced at Rs. 30,780 (earlier Rs. 29,500), while the iPhone X now starts at Rs. 92,430 instead of Rs. 89,000. The iPhone 8 and iPhone 8 Plus will now start at a MRP of Rs. 66,120 and Rs. 75,450 respectively, compared to Rs. 64,000 and Rs. 73,000 earlier. The iPhone 7 and iPhone 7 Plus will now start at Rs. 50,810 and Rs. 61,060 respectively, while the iPhone 6s and iPhone 6s Plus starting price will now be Rs. 41,550 and Rs. 50,740 respectively. As mentioned earlier, the only iPhone model unaffected by the price hike is the iPhone SE, which is being assembled in India by Wistron since May this year, and thus is exempt from import tax. Note that the prices mentioned are MRPs, and almost all iPhone models are typically available at lower prices via offline and online retail channels, thanks to various cashbacks and other ongoing offers. According to Counterpoint Research, Apple imports 88 percent of the phones its sells in India, so the company had no option but to increase prices after the government’s decision to increase import duty on mobiles and other electronics. However, by itself, the move is unlikely to have a huge impact on Apple’s sales, as buyers in the premium end of the market are unlikely to be deterred by a 3.5 percent hike. Counterpoint says that eight out of ten mobiles sold in India are being assembled here, which means if the government continues to be hostile towards imports, Apple will need to figure out a way of expanding its India manufacturing operations, or risk losing ground to its competitors. The Cupertino-based company has reportedly been looking for tax breaks and other government incentives to do just that, but has so far failed to reach an agreement with the Indian authorities. Having said that, Apple is far from the only company that is impacted by government’s latest decision. With import tax on video cameras increased from 10 to 15 percent, and doubled to 20 percent for television sets – in addition to the hike in the import tax on mobile phones – expect a few other electronics products to become costlier in the near future as well.